May14 is National Buttermilk Biscuit Day. It's time to celebrate biscuits, that go well with gravy. Biscuits appeared in the USA prior to Civil War. Cooks used them as a cheap addition to meals. As far as biscuits do not require yeast, it's a kind of quickbread, that anyone can make for dinner and even breakfast. The leavening agent in biscuits is baking soda, that reacts with buttermilk. The reaction results in production of carbon dioxide bubbles, that let dough expand while baking. As far as biscuits do not require any time for leavening, busy moms can bake them for breakfast. Biscuits became popular when people realized, that their hardness, compared to sliced bread, worked better to wipe up gravy on the plate. This evolved into a well-known meal, biscuits and gravy. Biscuits are great as breakfast bread and they are usually served with butter, molasses, jam, honey. Although dough for biscuits contains a healthy dose of butter, many people butter biscuits after they were served. 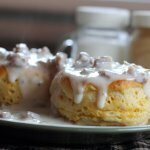 No matter how you prefer buttermilk biscuits, it would be great to bake them for National Buttermilk Biscuit Day.